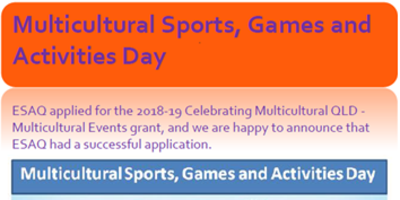 Brisbane Bangla Language School is organising a multicultural festival on Sunday 3 March 2019 from 11am to 8pm at Robelle Domain, Springfield Central to celebrate the International Mother Language Day and Harmony Day together at one event. The Mother Language Day has been observed each year on 21 February worldwide to promote awareness of linguistic and cultural diversity. International Day for the Elimination of Racial Discrimination has been observed in Australia as Harmony Day on 21 March each year. Considering the significance of both Days and the increased study commitments of the students during the second half of March, the festival has been planned in the middle of 21 February and 21 March. We believe, learning the messages of these Days from young ages are good for our community, particularly for our After-Hours Ethnic School communities. The purpose of this event is to unite the celebration of languages and cultures that make up our Brisbane on a fun-filled day of performances, food, cultural items from all around the world. 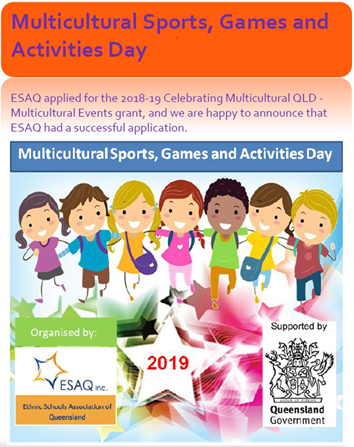 The major sponsor of the festival is Multicultural Affairs Queensland (MAQ) and supported by the Ethnic Schools Association of Queensland (ESAQ). This event will be similar to the event that ESAQ organised in August 2016. Each AHES will be given 5-15 min time slot to showcase their traditional cultural items. If you are interested in getting involved in organising the event, showcasing your cultural performances, booking a stall space (for food, handicrafts, other business etc), or sponsoring the festival in any way, please contact Rafiul Alam on 0433195436 or Irene Bayldon on 0411479019.